In February 1818, shortly after Camille’s eighteenth birthday he enrolled at the École des Beaux-Arts in Paris where he received his initial art tuition in the workshop of the French artist, Alexandre-Denis Abel de Pujol, but remained with him for just a short period before working in the studio of Antoine-Jean Gros, the French history and neo-classical painter, where he learnt to paint landscapes, marine paintings, historical subjects and genre scenes. He used both the mediums of watercolours and oil and was taught the secrets of lithography, which at the time was a new method of printmaking. He remained in Antoine-Jean Gros’ workshop for three years. One of Roqueplan’s fellow students at L’ École des Beaux-Arts was the Nottingham-born, English painter Richard Parkes Bonnington, eighteen months younger than Roqueplan, who had moved to Paris when he was fourteen years of age and began studying at the École des Beaux-Arts in 1820. Bonnington favoured landscape painting and this no doubt influenced Roqueplan who began to produce small-scale paintings including some landscape works. Roqueplan was also influenced by the works of the Scottish historical novelist, Sir Walter Scott and in 1824 he completed a work entitled Historical Landscape based on Scott’s novel, Quentin Durward. Another small painting by Roqueplan, which he completed around 1829, also featured characters from a Sir Walter Scott romantic tragedy novel, Kenilworth, in which we see the heroine Amy Robsart pleading for forgiveness from her father, Sir Hugh Robsart but he is untouched by her tearful pleadings. This work, entitled The Pardon Refused, is housed in New York’s Metropolitan Museum of Art. Around 1835, Roqueplan changes his painting style from small landscape paintings to large-scale anecdotal works and one of his most famous of these can be seen at the Wallace Collection in London. It was completed by Roqueplan in 1836, in time to be exhibited at that year’s Salon in Paris. It is a large painting, measuring 219cms x 174cms and is entitled The Lion in Love. The work is all about the power of love even if it is at the expense of wisdom. I am sure many of us know how that feels! The painting is based on a fable written by the Jean de la Fontaine, who was the most famous French writer of fables and one of the most widely read French poets of the 17th century. There are 243 of these fables, originally written in French, by the poet in the late 1600’s which have since been translated in to many different languages. The Lion in Love is a sad tale which tells of a noble lion, which has fallen in love with a shepherdess. His love for the girl is so strong that he unwisely consents to her father’s demand that his teeth and claws are clipped lest they should hurt his daughter . The lion does not see through the father’s trickery and when his teeth and claws are paired down, his defence mechanism is rendered ineffectual, enabling the father to set his dogs on the defenceless lion. 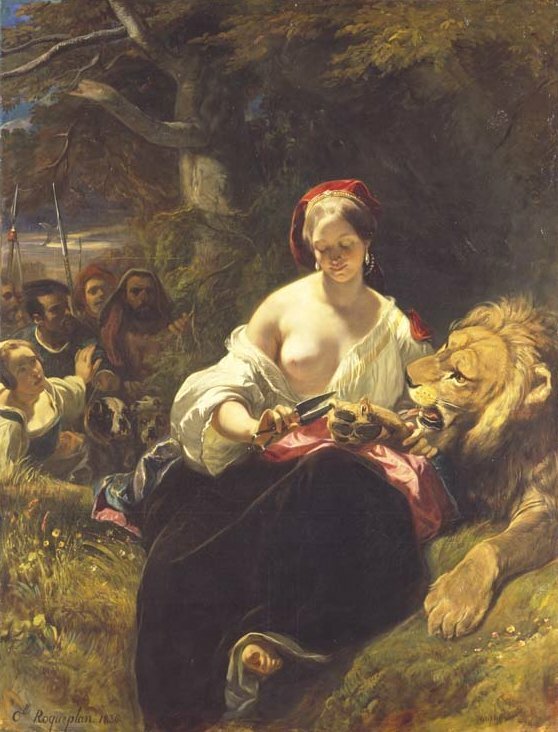 The question of who shaves down the teeth and claws of the lion is not told in the poem but in Roqueplan’s painting he depicts the act being carried out by the shepherdess herself. Maybe Roqueplan was drawing a parallel with the biblical tale of Delilah shaving off the hair of Samson, which rendered him defenceless. Below is an English translation of the poem by Jean De La Fontaine which I found on the Aesop’s Fables website. A lion tamed by Love? Love is a strange master. Only through tales, minus its pains! By zeal or by gratitude. To be accepted in our circles. And a beautiful head, moreover. He asked for her in marriage. A son-in-law a little less scary. When you’ll wish to caress her. Be filed down at the same time. His heart was so blinded! He did not resist much. Roqueplan’s health deteriorated in 1843 and as an aid to recovery he spent time in the foothills of the Pyrennees with its fresher and cleaner air. He remained there for three years during which time he painted many scenes depicting mountainous landscapes and peasant life. One such work can be found at the Wallace Collection in London with the title Peasants of the Béarn dated 1846. Béarn is a French province in the Basse-Pyrenees and one of the geographical features of this province is the Ossau Valley. 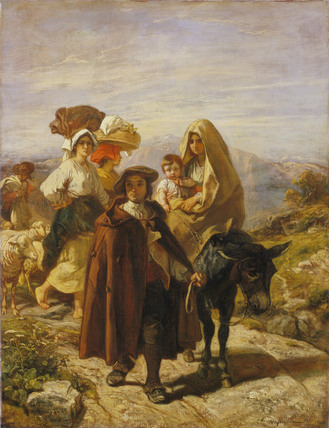 It may be more than just a coincidence, but at the 1847 Salon, the year after the completion date given to Peasants of the Béarn, Roqueplan exhibited a work with the title, Peasants of the Valley of Ossau. 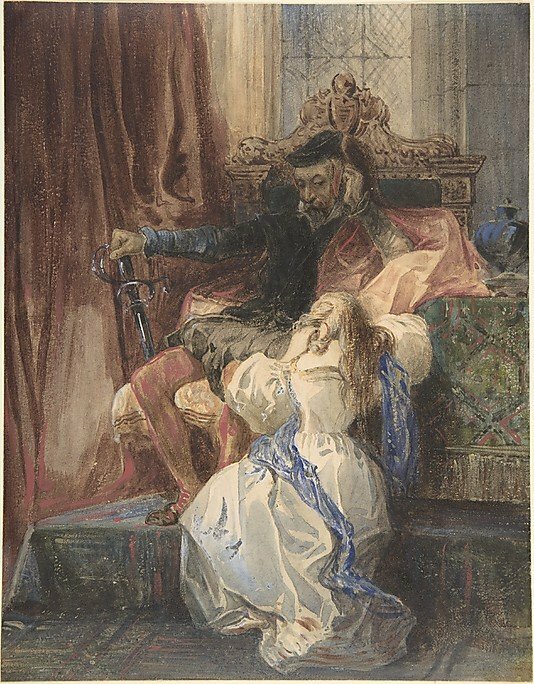 Could these be one and the same painting? Another painting of his which I like was painted around the same time, 1843. It is an oval work, entitled Girl with Flowers and is now housed in the Hermitage Museum in St. Petersburg. 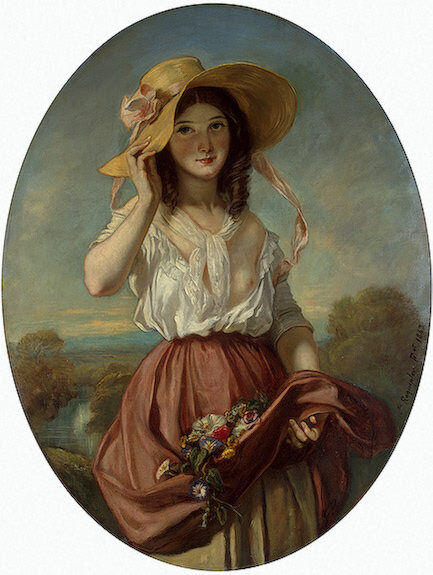 It is an everyday genre piece in which we see a young girl walking home with a bunch of wild flowers that she has collected, and which are held carefully in the folds of her raised skirt. She is young and pretty. 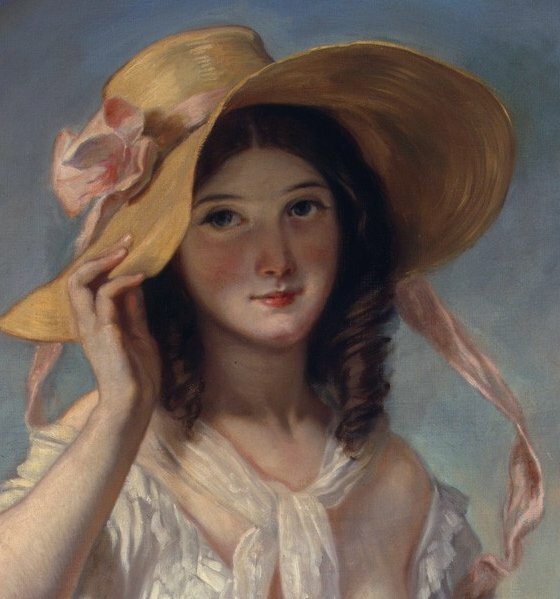 On her head is a wide-brimmed straw-coloured hat adorned with a pink flower and ribbons that seem to flutter down and fly off behind her giving us an impression of motion. She holds on to the brim of her hat, pulling it downwards affording her more shade from the sun and maybe ensuring it does not fly from her head due to the breeze. The hat frames her face. She looks at us enticingly and we cannot help but fall under the spell of her young beauty. What of course is more haunting is the sight of her left breast which has been uncovered due to lowering the neckline of her white linen blouse. In the painting we see Rousseau, having climbed a little way up the cherry tree, is dangling the fruit above Madamoiselle Galley. 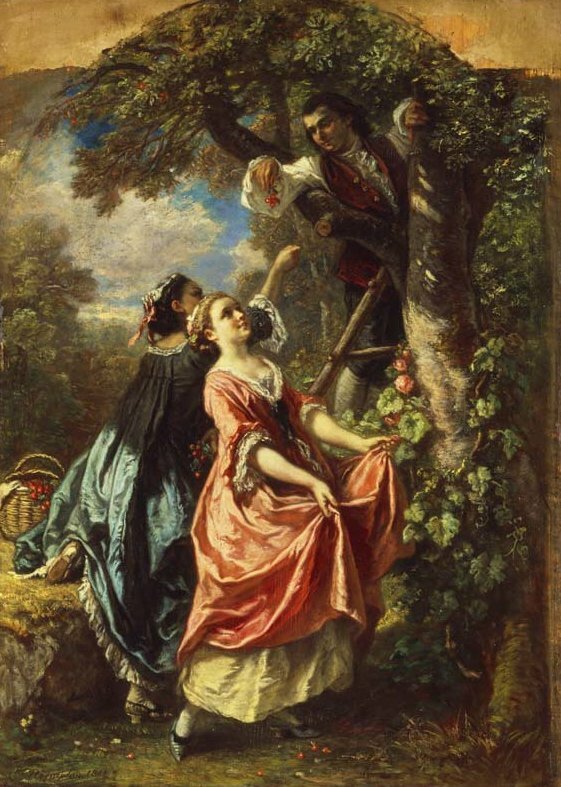 She stands holding her apron open to catch the fruit but Rousseau has other ideas as to where the cherries should land! The smile on her slightly flushed face is an indication that she too would like the cherries to be his lips. 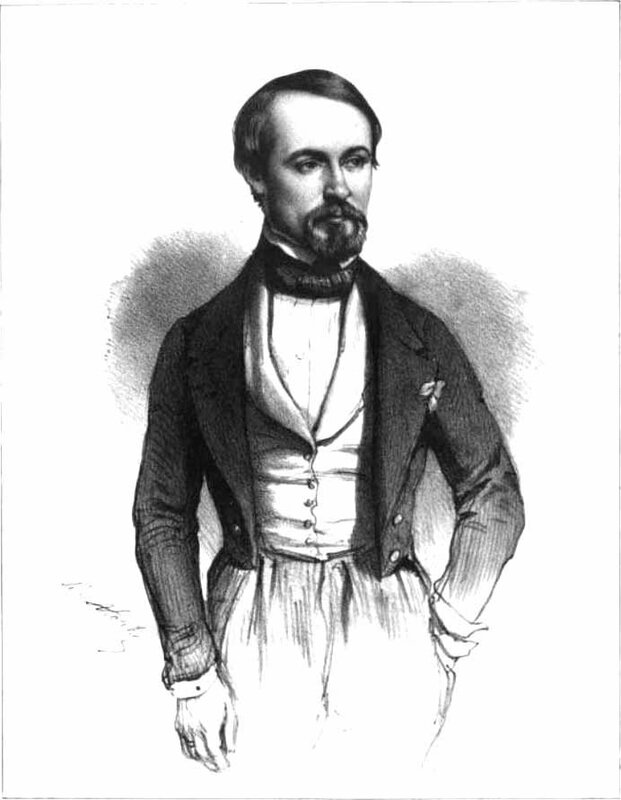 Camille-Joseph-Étienne Roqueplan died in Paris in September 1855, aged 55. In this and my previous blogs about Gabriel Metsu I have featured paintings which are housed at the Wallace Collection in London. If you are ever in London and want to visit an art gallery but are spoiled for choice, you must go to this one. It is right in the centre of town, a five minute walk from the major department stores on Oxford Street. I can assure you that you will not be disappointed with the collection. Previous Previous post: Alexandre-François Desportes. The Animal and Still Life painter.